Being the second largest state in the Peninsular of Malaysia, Perak is a good place to stay with wide array of accommodations and attractions being offered here. Whether you wish to enjoy a calm and relaxing vacation in the state or go further to explore the neighboring states, it is only 1 hour drive to Penang and about 2 hours drive to Selangor. There are a lot of affordable and inexpensive places to stay in Perak, ranging from beach resorts to city hotels that suit every budget for every type of travelers. Formally known as a mining town, Taiping is a heritage town that worth for a visit during your vacation in Malaysia. For those who wish to stay amidst the 100 years old rain trees and breathe in some fresh air, there are several hotels located in the Taiping Lake Gardens area. Visitors not only able to enjoy a walk in the garden and also able to visit the Taiping Zoo and the oldest Museum in Malaysia that are both located in close proximity with the hotels here. 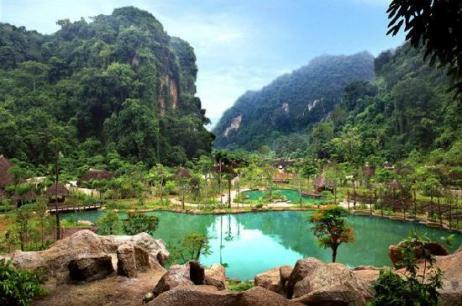 For nature lovers, Ipoh homes to several limestone caves located near to the town area. There are not many luxurious hotels in Ipoh town but there are quite a few 2 stars and 3 stars hotels as well as home stay available that are truly fantastic hideaways where you can relax. Recently, there are also several hot springs retreats being built in this area to cater for travelers who are looking for a relaxing family getaway. The perfect place to visit if you are looking for island retreat in Perak is the Pangkor Island. Ranging from 5 star luxury resort to affordable backpacker hotel, there are all types of accommodation in Pangkor Island that suit to every budget. The magnificent white sandy beaches on the island will definitely offer a wonderful family retreat or honeymoon vacation. As Pangkor Island is one of the famous islands in Malaysia for vacation, it can become very full and happening during the peak seasons. It is always a good choice to make a pre booking on the hotels to avoid any troubles during your vacation.